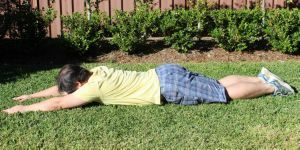 Stretches and Exercises for whole body range of motion and function. Exercise is a vital part of improving and maintaining normal, comfortable whole body and especially back function. It is important to exercise regularly so you can maintain your fitness level. Regular exercise is important to prevent back, neck and leg pain and injury. A program of strengthening, stretching and aerobic exercises will improve your overall fitness level. Research has shown that people who are physically fit are more resistant to injuries and pain, and recover quicker when they do have injuries, than those who are less physically fit. In addition, consider maintaining an average weight for your height (mayfieldclinic.com). There should be NO PAIN. If there is, lean into the stretches less. 1. This stretch improves spinal mobility, lower back muscles and gluten area. Keep shoulders flat on the floor, palms down and do not raise them. Slowly rotate the legs in alternate directions. Keep ankles together. Keep hold of each side for 10 seconds. 2. This exercise improves stability of the trunk, lower back and abdominal muscles. Begin with knees bent, crossing arms in front of chest and slowly raise chest from the floor. Make an effort to use your core muscles and NOT your neck muscles. Complete 3 sets of 10. 3. This stretch improves flexibility of hips, legs and lower back. Bring the knee towards your chest. Keep head on the ground. 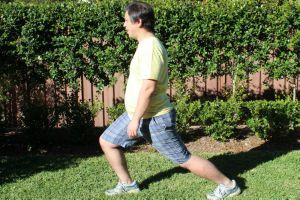 Keep the leg that is on the floor straight, knee slightly bent with your toes pointing upwards. Hold for 15 seconds. Repeat with opposite leg. 4. This exercise helps to build strength and stability. Lie on the floor, face down, stretch arms outwards over your head. Keep your right leg straight and lift your left leg 10-20cm above the ground, along with the left arm as shown. Hold for 5 seconds. Pause before swapping sides. Alternate with the other knee and arm. Repeat 10 times each side. 5. This strength building exercise is for low back and core stability. Start on your hands and knees. Position your hands directly beneath your shoulders and your knees directly beneath your hips. Have your fingers fully spread and pointing straight ahead. Make your back horizontal and flat. Toes pointing downwards. Lift left leg and right arm at the same time keeping body horizontal. Hold for 5 seconds. Pause before swapping sides. Alternate with each other leg and arm. Repeat 10 times. Simple but challenging. 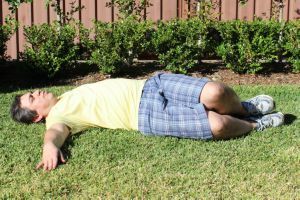 Lie on your stomach, elbows close to your sides and directly under your shoulders. Engage the abs and slowly lift your torso off the ground, maintaining stiff torso and legs. Avoid sagging at the lower back or lifting up your hips. Continue to breathe in through the nose and out through the mouth deeply for 15 seconds. Repeat 3-5 times. 7. This stretch works on the hips and the low back muscles. While standing put one foot at the front of the other track stance. The front leg should have some bend and the back leg should be straight. 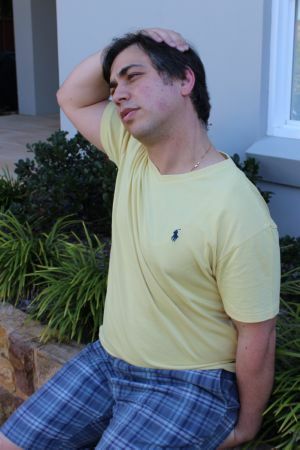 Then lean forward by bending the front leg and keep in good posture. You should feel this stretch in the front part of the thigh on the lag that is in the back. It helps to have your hands on your hips for balance. 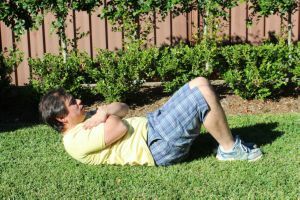 Hold stretch for 20 seconds and alternate to other leg.Repeat 3 times each leg. 8. 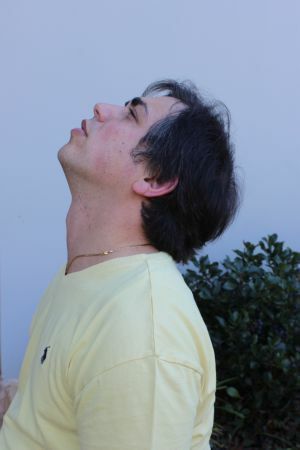 This side of neck and top of shoulder stretch is especially helpful for those sitting at a desk all day. 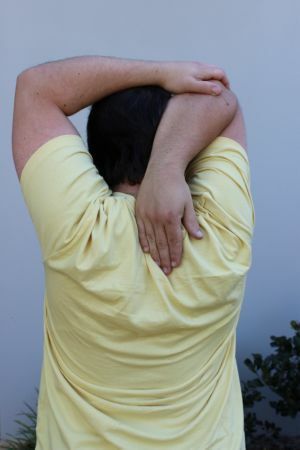 Gently bend your ear to your shoulder and it is optional to use your hand to lengthen the stretch. You can also sit on the hand of the side being stretched for stability. There should be No Pain. Repeat with alternate side for 5 seconds. 9. Neck Range of Motion. Begin in the neutral position and slowly bend head forward, back and rotate and bend to each side. Then hold in the back position for 5 seconds. Repeat 3 times. Pause between each set and make sure you are sitting as this may cause dizziness. 10. 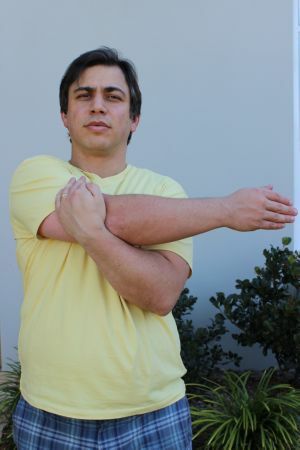 This stretch helps to improve stability and range of motion of the shoulder. Stand in a stable and good postural position. Use your left hand to pull on your right arm across the front of your chest. Repeat each side 3 times. 11. Overhead stretch helps to maintain flexibility and range of motion. 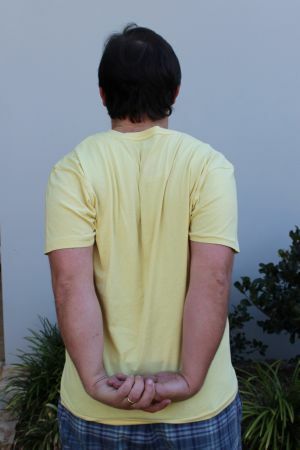 Stand straight with your shoulders back and chest out. Raise one arm overhead, bend the elbow and place your hand behind your neck. Grasp the elbow with the other hand and gently pull it behind your head. Hold for 10 seconds. Repeat with opposite arm. Begin standing up straight with shoulders relaxed and back. Squeeze the shoulder blades together. Clasp your hands behind your lower back. Stick out your chest. Hold for 10 seconds. Repeat 3 times.